Meet Alaska’s most iconic artist, Byron Birdsall, on Sunday, Sept. 14 from 1 to 4 p.m. at Rob Schouten Gallery during Greenbank Farm’s Second Sunday at the Farm. 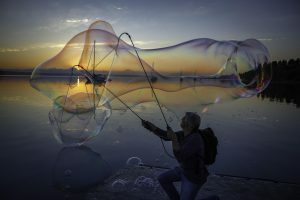 Birdsall is one of Alaska’s most prolific artists, who lives part-time on Whidbey Island. 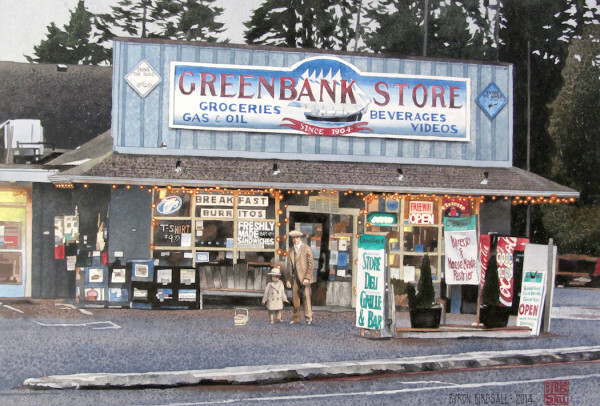 He’s made beautifully detailed watercolor paintings of Whidbey featuring all the favorite haunts: Downtown Langley in the snow, downtown Coupeville in the old days, the building of Deception Pass Bridge and the Greenbank Store featuring visions of the Hunziker family. “Billy Hunziker and his Daddy Go Shopping,” watercolor by Byron Birdsall. Other works include magnificant renderings of Mt. Rainier, Mt. 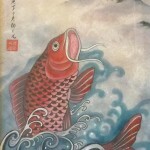 Shuksan, Japanese influenced pieces and religous icons. It’s a variety of work and shows the extensive gamut of the 81-year-old painter’s artistic skill. Come on in and meet him! Birdsall’s show, “Island Times… Greenbank and Beyond,” runs through Sept. 29.